Bring security and peace of mind to your home with the Window and Door Alarms by Stalwart. Each of these sensors is small enough to attach to nearly any door or window in your home with the included double-sided tape. 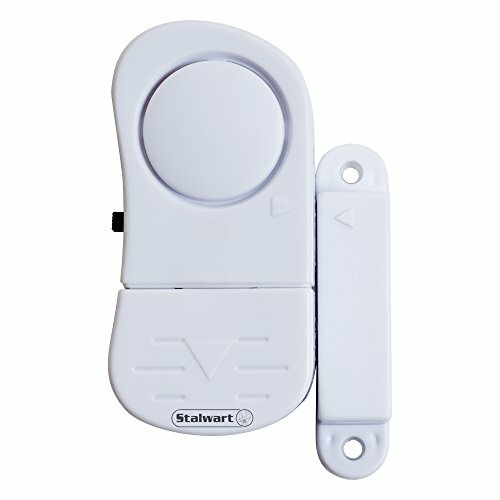 The magnetic sensor alerts you with a 105-decibel alarm when a window, door or cabinet is opened. These wireless alarms run on 3 LR44 button batteries and are not WiFi capable, so they’ll operate even if your home loses electricity or internet access, keeping your family safe in any situation. These perimeter alarms come in a set of 8, so you can have whole home protection. They’re also great for protecting display cases and cash registers in businesses. SATISFACTION GUARANTEED- Stalwart is committed to providing the consumer with the absolute best price and value on all of our products, which we ensure by applying a rigorous quality control process. NOTE: This is an exclusive product of Stalwart and ONLY Window and Door Alarm 8 Packs by Stalwart are GUARANTEED to be genuine IMPORTANT: Avoid buying counterfeit products and transacting with unauthorized sellers. Look for our logo on the packaging for every one of our products. Stalwart is a registered trademark protected by U.S. Trademark law and will be vigorously defended.